About 300 million tons of plastic, largely resistant to biodegradation, is produced globally each year. Only about 10 percent of that is recycled and the rest ends up polluting every corner of the globe. Plastic constitutes approximately 90 percent of all trash floating on the ocean's surface. Therefore, It is urgently needed to find solutions for plastic degradation. Roughly 92% of plastics fall into two main categories: Polyethylene(PE) and Polypropylene(PP). Polyethylene represents 40% of total demand for plastic products every year. Scientists have made few attempts but observed slow polyethylene biodegradation in given appropriate conditions. For example, modest degradation of PE was observed after nitric acid treatment and incubation for 3 months in a liquid culture of the fungus Penicillium simplicissimum. Slow PE degradation was also recorded after 4 to 7 months exposure to the bacterium Nocardia asteroides. In both cases, fourier transform infrared spectroscopy (FTIR) analysis of treated samples revealed production of ethylene glycol, a compound used in all kinds of products, including brake fluid, paints, plastics and even cosmetics. According to journal Current Biology published on 24 April 2017, Federica Bertocchini of the Institute of Biomedicine and Biotechnology of Cantabria in Spain said they have found that the larva of a common insect, Galleria mellonella, is able to biodegrade one of the toughest, most resilient, and most used plastics: polyethylene. Plastic biodegraded by 10 worms in 30 minutes. 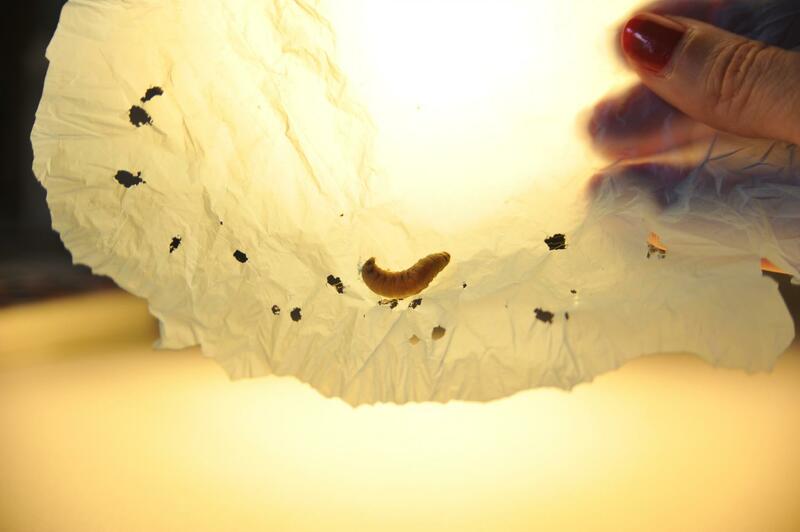 Bertocchini and her colleagues made the discovery quite by accident, after noticing that plastic bags containing wax worms quickly became riddled with holes. 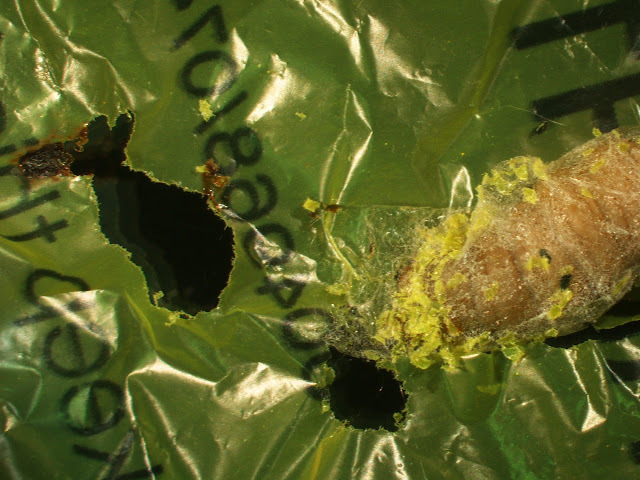 Alongside University of Cambridge biochemists colleagues Paolo Bombelli and Christopher Howe, Bertocchini then conducted a timed experiment in which 100 worms were exposed to a plastic supermarket bag. Within 40 minutes holes began to appear, and after 12 hours a reduction in plastic mass of 92 milligrams from the bag had appeared. These statistics suggest it would take 100 worms one month to break down the average 5.5-gram polyethylene grocery bag. Bertocchini said it is not known whether wax worms be capable of breaking down other varieties of plastic, such as polyvinyl chloride (used to make products like clear food packaging and shampoo bottles), polystyrene (used to make food trays and egg cartons) or polypropylene (used to make yogurt tubs and condiment bottles).